Freedom and Flourishing: Why do many individuals voluntarily moderate their contributions to global environmental problems? Why do many individuals voluntarily moderate their contributions to global environmental problems? I think serious consideration should be given to the question of why many individuals voluntarily moderate their own contributions to global environmental problems. Prospects for human flourishing may well depend on the increased willingness of many more people to moderate their individual contributions to climate change. Voluntary contributions may not be enough, but what people are willing to volunteer to do themselves can be expected to have an important influence on the extent to which they are willing to impose regulation on others. A decade ago I suggested that people who voluntarily reduce their contributions to climate change deserve our respect, but I referred to them as environmental puritans. I remember being told that terminology wasn’t respectful. Religious zealotry certainly doesn’t provide a complete explanation of such behaviour. Voluntary action by individuals to moderate their contributions to global problems is difficult to explain in conventional economic terms because people must know that their personal actions will have a negligible impact on global problems. So, why does it happen? The most cynical explanation I can think of is virtue signalling. Some firms and individuals engage in the behaviour because they obtain additional profit, or just personal satisfaction, from admiration they receive by appearing to be virtuous. Even though virtue signalling isn’t particularly commendable, good outcomes can flow from it. If companies can make higher profits by presenting an environmentally friendly image, good luck to them. If community organisations can further their objectives by bestowing honours on people whose motive is to be admired by other members, good luck to them too (provided, of course, we are not talking about organisations that infringe the rights of non-members e.g. terrorist organisations). Leaving cynicism aside, the most obvious explanation is that people are willing to moderate their behaviour because of genuine ethical intuitions or considerations. It feels like the right thing to do and/or they consider such behaviour integral to their values and their flourishing as individual humans. It is reasonable to speculate that such ethical feelings and considerations are strongly linked to perceptions of personal identity. Those who perceive themselves as giving a high priority to environmental protection tend to see themselves as citizens of the world. 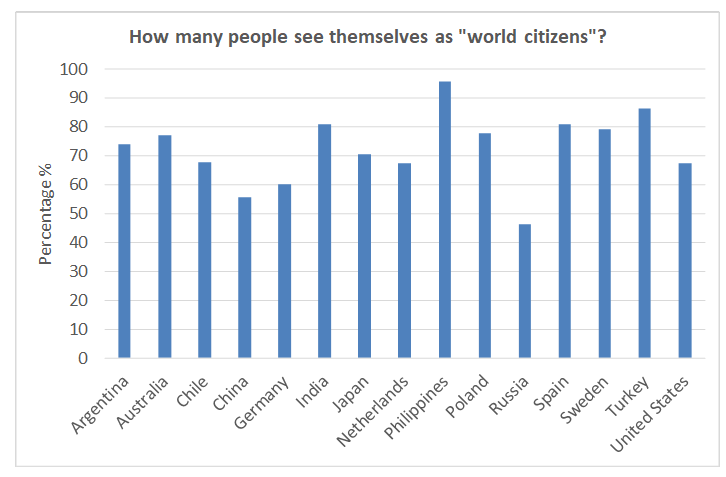 For example, of those U.S. respondents to the World Values Survey conducted a few years ago who identified with the proposition “looking after the environment is important to this person”, 83% saw themselves as “a citizen of the world”. The corresponding percentages were much lower for people who didn’t perceive looking after the environment to be important. As shown in the chart at the beginning of this post, the percentage of people who perceive of themselves as citizens of the world is quite high in many countries. I don’t claim to know much about what is going on in the minds of those people. My guess is that when people say that they see themselves as citizens of the world, they are recognizing that they have a common interest with other humans in seeking solutions to global problems. It seems reasonable to expect people who see themselves as citizens of the world would be more likely to moderate their personal contributions to global environmental problems without requiring inducement than those who identify solely as members of local communities, ethnic or religious groups, or nations. As implied earlier, some people who moderate their own contributions to global environmental problems seem to be puritanical in their beliefs about appropriate behaviour towards the environment. That could be because of they are deeply religious, whether as followers of contemporary religions or as Gaia worshippers. It is hardly surprising to see religions urging their followers to have regard to the global environment and the well-being of future generations of humans, and to see some of adherents become environmental zealots. It also seems reasonable to speculate that more people will voluntarily moderate their personal contributions to global environmental problems when they observe others doing likewise. They know their own personal contributions will have a negligible impact on global problems, but they don’t consider them to be futile because they feel that their contributions are part of a collective effort. Those who seek to provide an example for others, by making an unusually large contribution, may see their contribution as having a potential snowball effect. The motivations of many of those who voluntarily modify their contributions to global environmental problems are only weakly contingent on the behaviour of others. Their behaviour seems to be motivated primarily by benevolence towards future generations of humans and other species. There is no social contract regarding voluntary moderation of contributions and there is no possibility that every human would agree to moderate their behaviour in this respect in the absence of regulation. An individual cannot induce others to moderate their greenhouse gas emissions merely by threatening to cease moderation of their own behaviour if their example is not followed. By contrast, Elinor Ostrom observed that in a successfully managed commons where access to shared resources is limited, individual participants make contingent self-commitments. The willingness of participants to follow a set of rules that has been devised collectively is contingent on other participants making a similar commitment and acting accordingly. An important factor involved in voluntary moderation of relevant behaviour is belief that human action is causing detrimental climate change. People, like me, who believe that there is a low probability of catastrophic climate change within the next 30 years, or so, might also be willing to moderate their behaviour voluntarily as an insurance policy for following generations, provided the cost of insurance – for example, use of renewable energy in place of fossil fuels - is relatively low. More people can be expected to join the movement to moderate their behaviour if they perceive that environmental catastrophe is becoming imminent and/or if it becomes less costly to reduce the exposure of their children and grandchildren to global environmental risks. The benevolent private behaviour of environmentalists with respect to global environmental problems is often combined with advocacy of government action to compel others to modify their contributions. Any lover of liberty would find such coercion difficult to endorse, but there are strong precedents for it. One readily defensible movement that has acted similarly in the past is the movement for abolition of slavery in the 19th Century. As well as endeavouring to ensure that they did not profit from slavery, members of anti-slavery organisations advocated government action to abolish it. If concerted government intervention is needed to avoid a global climate catastrophe, and if there is enough support by governments and citizens of enough countries to ensure that effective action can be taken, it would be difficult to argue that no action should be taken that would infringe the liberty of those individuals opposed to the intervention. Please note that there is more than one big “if” in the preceding sentence. I just want to make the point that it does not make sense for anyone to insist on the primacy of liberty if human survival is really at stake. In order to flourish, our descendants need to survive. Do conservatives understand the motivations of world citizens? "Nothing in politics stands still, and increasingly left-wing environmentalists are dissociating themselves from the campaigning NGOs, and preferring the small-scale work that both supports and expresses the low-impact way of life. The movements for low carbon communities, slow food and permaculture have recruited many who identify themselves as ‘on the left’. Indeed, this shift away from radical, government-shaped solutions should be welcomed by conservatives, since it promises the thing that environmentalists of both persuasions need, which is a way of sharing our problems and co-operating in solving them." I think that may be wishful thinking. From where I sit in Australia, I don’t see left-wing environmentalists increasingly dissociating themselves from campaigning NGOs. There are some environmentalists who would identify as having leftish views who are disgusted with the antics of environmental NGOs and Green politicians and want nothing to do with them. But I don’t see a general trend in that direction. I do see a trend toward more alliances between radical environmentalists and people who could be considered to hold conservative views. I see alliances between farmers and radical environmentalists to prevent fracking to extract of coal seam gas, because that may contaminate ground water. I see alliances between residents of leafy suburbs and radical environmentalists to prevent higher density housing projects. I also see more people with conservative views supporting independent political candidates who want a greater national contribution to international efforts to combat climate change. “It is a motive in ordinary people. It can provide a foundation both for a conservative approach to institutions and a conservationist approach to the land. It is a motive that might permit us to reconcile the demand for democratic participation with the respect for future generations and the duty of trusteeship. It is, in my view, the only serious resource that we have, in our fight to maintain local order in the face of globally stimulated decay”. However, Scruton’s response to the slogan, ‘think globally, act locally’, seems odd. He suggests that while many environmentalists acknowledge that local concerns must be given a proper place in our decision-making, they tend to balk at the suggestion that “local loyalty should be seen in national terms, rather than as the small-scale expression of a humane universalism”. He suggests that were conservatism to adopt a slogan, it should be ‘feel locally, think nationally’. He argues that doesn’t mean that conservatives are all belligerent nationalists: They think in terms of the nation state because “they recognize that, in the current environmental crisis, there is no agent to take the needed measures, and no focus of loyalty to secure consent to them, other than this one". I am uncomfortable with the idea that local loyalty should be seen in national terms. National loyalties overlap with local loyalties in some respects, but most environmental problems seem to be either local or global. Humane universalism seems to me to be a mark of civilised behaviour. Nevertheless, I accept that the national state is the only governance system available which has potential to deal with global problems that cannot be resolved by the voluntary actions of individuals. That doesn’t mean that I have a great deal of faith in the capacity of nation states to resolve such problems. Perhaps voluntary action enhanced by blockchain technology offers more hope over the longer term. Roger Scruton is correct in his assertion that conservatives think in terms of nation states. They are statists. But that is also true of Green politicians and their ardent supporters, who argue vociferously for greater action at a national level to reduce emissions of greenhouse gases. In attempting to push individual nation states to rapidly reduce greenhouse gas emissions at a national level, Green politicians have caused a backlash from voters concerned about rising energy prices and the unfairness of being asked to make greater sacrifices than those being made by people in other parts of the world. If Green politicians want effective action to avert the global climate change disaster that they greatly fear, they will need to adopt more effective political strategies that are capable of winning support from voters who are sceptical of claims of claims of imminent environmental disaster, but are prepared to make modest contributions to global efforts as a form of insurance for the benefit of future generations. How does Roger Scruton make a useful contribution? “Greenhouse gases are not like CFC gases. As things stand they can be eliminated only at great economic and even greater social cost, and few nations are prepared to pay that cost. By devoting their sparse supply of global goodwill to negotiating futile treaties against emissions, the nations are wasting assets that could be spent on co-operative research into renewable energy." 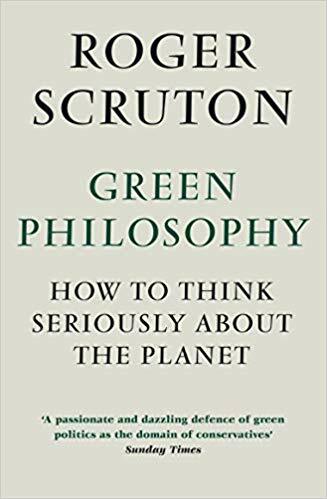 I think Scruton is both too optimistic and too pessimistic in suggesting that “unilateral action on the part of a competent and law-abiding state”, such as the U.S., may end up being the only way the global environment can be defended. I take his point that the British Navy played a crucial role in ending the transnational market in slaves, but it is too optimistic to think that the U.S. could achieve much to combat climate change by acting alone. It seems too pessimistic to imply that there are no circumstances where international cooperation could result in effective action against climate change. The important point is that if we want individuals to moderate their contribution to global environmental problems – either through voluntary action or by supporting regulation – before environmental catastrophe is universally accepted to be imminent, then we need to make it less costly for people to take that action. A greater research effort is required to ensure that more efficient technologies become available as soon as possible.